The Goodreads team has approved my giveaway for NIRMALA: The Mud Blossom. It is scheduled to open for entries at midnight on Friday, August 15 and end at midnight on Monday, September 15. 3 copies of my book will be given away to Goodreads members in United States, Canada, United Kingdom, Australia, Afghanistan, Aland Islands, Albania, Algeria, American Samoa, Andorra, Angola, Anguilla, Antarctica, Antigua and Barbuda, Argentina, Armenia, Aruba, Austria, Azerbaijan, Bahamas, Bahrain, Bangladesh, Barbados, Belarus, Belgium, Belize, Benin, Bermuda, Bhutan, Bolivia, Bosnia and Herzegovina, Botswana, Bouvet Island, Brazil, British Indian Ocean Territory, Brunei Darussalam, Bulgaria, Burkina Faso, Burundi, Cambodia, Cameroon, Cape Verde, Cayman Islands, Central African Republic, Chad, Chile, China, Christmas Island, Cocos (keeling) Islands, Colombia, Comoros, Congo, Congo, the Democratic Republic of the, Cook Islands, Costa Rica, Cote D’ivoire, Croatia, Cuba, Cyprus, Czech Republic, Denmark, Djibouti, Dominica, Dominican Republic, Ecuador, Egypt, El Salvador, Equatorial Guinea, Eritrea, Estonia, Ethiopia, Falkland Islands (malvinas), Faroe Islands, Fiji, Finland, France, French Guiana, French Polynesia, French Southern Territories, Gabon, Gambia, Georgia, Germany, Ghana, Gibraltar, Greece, Greenland, Grenada, Guadeloupe, Guam, Guatemala, Guernsey, Guinea, Guinea-bissau, Guyana, Haiti, Heard Island and Mcdonald Islands, Holy See (vatican City State), Honduras, Hong Kong, Hungary, Iceland, India, Indonesia, Iran, Iraq, Ireland, Isle of Man, Israel, Italy, Jamaica, Japan, Jersey, Jordan, Kazakhstan, Kenya, Kiribati, Korea, Democratic People’s Republic of, Korea, Republic of, Kuwait, Kyrgyzstan, Lao People’s Democratic Republic, Latvia, Lebanon, Lesotho, Liberia, Libya, Liechtenstein, Lithuania, Luxembourg, Macao, Macedonia, the Former Yugoslav Republic of, Madagascar, Malawi, Malaysia, Maldives, Mali, Malta, Marshall Islands, Martinique, Mauritania, Mauritius, Mayotte, Mexico, Micronesia, Federated States of, Moldova, Monaco, Mongolia, Montenegro, Montserrat, Morocco, Mozambique, Myanmar, Namibia, Nauru, Nepal, Netherlands, Netherlands Antilles, New Caledonia, New Zealand, Nicaragua, Niger, Nigeria, Niue, Norfolk Island, Northern Mariana Islands, Norway, Oman, Pakistan, Palau, Palestinian Territory, Occupied, Panama, Papua New Guinea, Paraguay, Peru, Philippines, Pitcairn, Poland, Portugal, Puerto Rico, Qatar, Réunion, Romania, Russian Federation, Rwanda, Saint Barthélemy, Saint Helena, Saint Kitts and Nevis, Saint Lucia, Saint Martin, Saint Pierre and Miquelon, Saint Vincent and the Grenadines, Samoa, San Marino, Sao Tome and Principe, Saudi Arabia, Senegal, Serbia, Seychelles, Sierra Leone, Singapore, Slovakia, Slovenia, Solomon Islands, Somalia, South Africa, South Georgia and the South Sandwich Islands, South Sudan, Spain, Sri Lanka, Sudan, Suriname, Svalbard and Jan Mayen, Swaziland, Sweden, Switzerland, Syrian Arab Republic, Taiwan, Tajikistan, Tanzania, United Republic of, Thailand, Timor-leste, Togo, Tokelau, Tonga, Trinidad and Tobago, Tunisia, Turkey, Turkmenistan, Turks and Caicos Islands, Tuvalu, Uganda, Ukraine, United Arab Emirates, United States Minor Outlying Islands, Uruguay, Uzbekistan, Vanuatu, Venezuela, Viet Nam, Virgin Islands, British, Virgin Islands, U.S., Wallis and Futuna, Western Sahara, Yemen, Zambia, and Zimbabwe. I count on your wholehearted support to make this Giveaway a success. Feel free to reblog my post throughout the Giveaway period and do click the Enter to win button midnight on Friday, August 15. Thanks Ma’am for your support. With love. 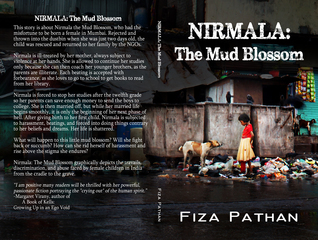 There is a Goodreads giveaway for Nirmala: The Mud Blossom by Fiza Pathan which will be an amazing read. Please share.